This alpaca blog is intended to give a light hearted view of the day to day activities of an alpaca breeder, as well as providing an opportunity to share experiences and knowledge gained along the way. Beck Brow Alpacas of Cumbria is an alpaca farm situated within the beautiful Eden Valley in the North of England. 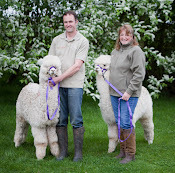 Our aim is to breed the finest quality alpacas available...this is our journey. Yesterday we had a very early start (4.15 to be precise) as we were off to Westmorland County Show. We only live an hour away, but as organisers of the alpaca show we have to be early on site. Thankfully, all the exhibitors kindly heeded my advice to arrive in plenty of time, as the alpaca marquee was down a rather muddy lane with no turning point; reversing skills were definitely tested! We took seven alpacas in total (six of our own and one belonging to Robyn and Craig) and all were placed between 1st and 3rd. The standard was high this year, with a number of the alpacas entered already having proven themselves as rosette winners at the British Alpaca Futurity. We only took white and fawns so were in some of the most competitive classes of the day. Beck Snooty Boots came a very credible second behind the eventual fawn female champion, with judge Cathy Lloyd commenting that there was really nothing between the top two, and that she would be very happy if both of them were in her own herd. Beck Brow Rumour Had It also came second behind the white female champion, as is always the case she got praised for her prettiness, as well as her fleece characteristics. Beck Brow Quintos and Beck Brow Magellan came second and third in the intermediate white male class (remember Quintos...first fleece like a Suri...beat Magellan!!!). Now, this is where the pattern ends; the boys didn't come second to the eventually white male champion. No, the white male champion was an adult...the white male champion was...Beck Brow Explorer! I had a lovely day, it is such a friendly show and it was great to catch up with so many breeders. An added bonus was Craig getting the sales man of the year award, for selling us out of all the adult knitwear that we had taken. It was a day of reflected glory; firstly for owning Explorer and secondly for my choice of judge. Cathy Lloyd did a fantastic job, which was commented on by so many of the exhibitors at the end of the show. It all ran very smoothly, and everyone knew exactly why they had been placed where they had. I think that we all came away having gained valuable knowledge about the strengths and weaknesses of our alpacas. Beck Brow Explorer before taking the championship...he was having none of it when it came to posing with his sash on! Beck Brow Explorer bowing to the President of the Westmorland County Show....Actually I think he might be saying "if you pat me on the head I'll have ya"...he is in fact supposed to be getting his photo taken receiving the trophy but he wasn't playing ball...it was raining though and he doesn't do rain! Roma is still having nothing to do with the adorable Foxy Sox...thanks go to Amanda, and to Mum and Dad, who shared bottle feeding duties yesterday. Hopefully next year Sox will be joining us at Westmorland as part of our show team! P.S I missed at Beck Brow Synergy...2nd placed beige intermediate male! Wow! What a star he is. Well done and many congratulations. Well done, great results, especially old Lardy pants! Explorer is looking fine in that top photo - congratulations on a great day all around! I do so love alpacas. As I said yesterday well done on your results and organisation of the show, having done it I know the effort that goes into organising a show.